There is a cycle of life. You are born, you live, and you die. But what happens in between the process of birth and death? What is the living part in between where we live? I am an avid flower gardener. I do it to relax and think. I will admit I do have a green thumb which helps the flowers live and thrive. But everything I know about gardening I taught myself through trial and error. I planted and dug plants up to replant them where they were best. I put out ground cover that took over everything and consequently had to dig up the entire bed to start over. Life is trial and error. The family that has experienced life before us want to tell us what is best. they don’t wantus to make the same mistakes, but we seem to think we have to make our own. But that is a subject for another poem and post. I am one of those people who talk to their plants. I don’t know if they thrive because I speak to them or if it is because while I am talking I breathe more oxygen onto them. Either way, they seem to do better. I often compare my perennials to the cycle of life. 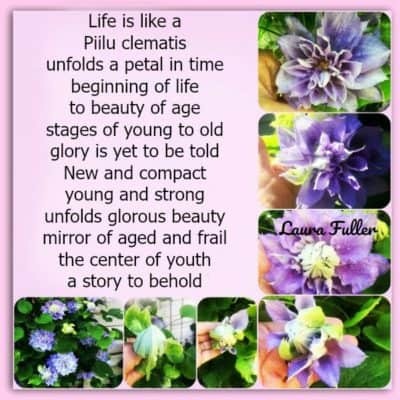 Just yesterday when I went to look at my Piilu Clematis I noticed the blooms were in different phases of growth. The beginning stage is compact, and it opens from there one petal at a time. It is like peeling back the layers of our life. When we are born, we are young, tender and compact. Life revolves around us. Then we begin to live as we grow. The layers start taking on shape and form. We build memories, make mistakes and have a story to tell. As you can see in the pictures, the clematis unfolds and mimics the cycle of life. It starts as a bud and with one petal at a time it grows. One day your turn around and it is in full bloom. A Piilu clematis is a glory to behold. This type of clematis is one of a kind. The flowers are big and glorious. But as in life the blooms, once they are full, have to die off. They face death the same way they unfold. The petals dry up to a brown color and fall off almost one at a time. I am sure it is not precisely this way, but it appears so to me. You are the same as a babe. As a baby, you are born perfect in every way. You are new but not yet experienced at anything and life is exceptional. Hopefully, you were loved, and your needs met. You don’t have to unfold and test your world. As a child, you step out of the protective fold just a bit. You explore and experiment. But you quickly return to the fold of your safe house only to venture out another time. Then you are a teenager. You are brave and strong, and nothing can harm you. You are invincible. The leaves of the Piilu clematis are almost in full bloom. Oh so close to full glory and the abundance of life. You step out in your independence knowing that nothing will happen to you. You are young. At this point, I can’t even pull a petal off of the clematis. The flower is firmly rooted and grounded just like you are. You are bulletproof. You turn 20 and life revolves around. Not because it is over but simply because this is the way God created us. From the moment we are born we begin to die. At the age of 20 give or take a bit we are turning corners to the process of cell death. There is nothing wrong with this process. If we thought we were invincible forever, we would never learn and grow. Life is moving over for more blooms and babies will come into being. the cycle of life continues. The petals begin to brown and fall off. But your life is not over. The flowers will rebloom again when your family all out of the house when you get to spend time with the grandbabies and spoil them. The story of our life unfolds with each layer we live until we reach the end of life. The aging process is one I refer to as a life of beauty. As one who cares for the aging I can see the beauty in the wisdom and memories they have to share. We can look back on life and live it again with stories. We can help our families with our experiences. The layers of the fragile flower are a testimony to the life you have lived. You are beautiful. 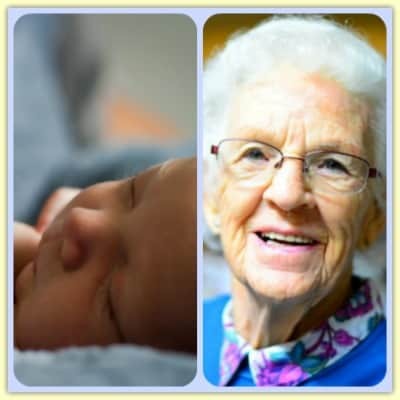 The next time you look at a person who is moving onto the aging side of life, don’t see wrinkles, see beauty in their face. See glory and wonder in their slow movements. See a complete set of life’s stories in their head. The elderly only have love in their hearts. They have a desire to share it and show their soul along with their experiences to the world. Take some time to hear the stories and learn from what they know. The elderly have lived their mistakes, and if you listen you can avoid many of those mistakes. We don’t take advice well from our family. But if you visit a nursing home, you will obtain great knowledge that will help you to prevent to same mistakes. Show respect to those who have gone before you for they have earned it with their trials in life. So often we believe that because the bones are frail and the wrinkles are many that the knowledge has dissipated. NOT true! Knowledge grows unto death when we are joined again with our Lord and savior and the cycle of life continues. Life is truly a cycle. I think death is not the end but a process to start a new life once again. We all go through different stages in a life cycle and we should live life to the fullest in all stages. You are absolutely right about showing respect to the old people as they have sacrificed their whole life for us. If we are successful or rich we owe them. Thanks for the article. It was great reading it. Yes, give life all you have while you are still here on earth. When we age we can only hope that someone will show us the same respect and love that you have shown to the aging in your life. Beautifully written. As I was reading this it reminded me of my father in law. When I met him years ago he shared with me his youth and than his he shared his adult life and how he met his spouse of 60 yrs. I listened to his wisdom than and I am so glad I did. You see his brilliant mind is now giving way to dementia and as I look I can see the cycle of life unfolding oh too soon. Cathy, I am so happy you could get to know your father-in-law. I am very proud of you for taking the time to spend with him and listening to his stories. Dementia is sad and all we have are our memories. It is good to have someone carry those memories on for us. Life is really a cycle and just like a that grows from small to the very to it grows big and Start glowing and when you look at it, you will notice that it is at its boom. But along this cycle of life, one shouldn’t live without a purpose while completing this circle for their is a reason why we are living and should be accomplished. Yes, you are right. We all have a destiny. We are given the gift of life to fulfill that destiny. Life is a process and each stage leads to anohter step in our progression.